Positive thinking is a mental attitude in which you expect good and favorable results. In other words, of positive thinking is the process of creating thoughts that create and transform energy into reality. A positive mind waits for happiness, health and a happy ending in any situation. Many people become attracted to this notion; good evidence is the increasingly courses and books about it. Positive thinking is gaining popularity among us today. Many and more successful people will tell you that they got where they are now because they made a lifestyle around positive thinking. A person that faces life with a positive attitude will always be more successful in life both professionally and personally, than a person that cannot take control of his thoughts. It is increasingly common to hear people say: “Think positive” to a person which is sad and worried. Unfortunately, many people do not take seriously this urge. 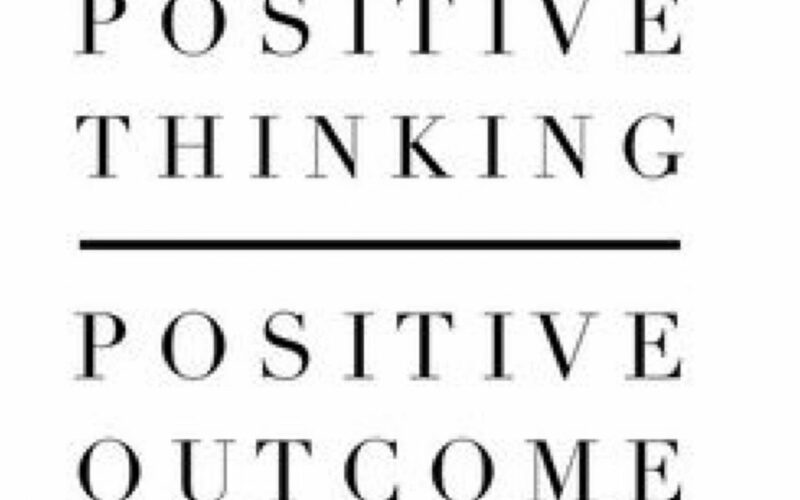 How many people do you know that sit-down and reflect on positive thinking. Imposing a positive thinking can be the best, thinking positive will also attract positive things into your life. You can change the negative level of thinking and make the best decision for yourself. Use positive words when talking. If you constantly say “I cannot” you could convince yourself, and replace positive words with negative ones. You can do everything possible to have a happy relationship, also do everything possible to have a brilliant career and stay in shape. Do not let negative thoughts and feelings conquer when you have a bad mood. Even if for a few hours a day, remove negativity and focus on the positive things in your life. Use words that evoke strength and success. Fill your thoughts with words that make you feel strong, happy, having control over your life. Make an effort to focus on these words rather than the ones that suggest failure or incompetence. One of the most common exercises for a positive thinking is positive affirmation. What does that mean? Start repeating a positive phrase like “I deserve to be happy” or “I deserve to be loved.” Believing that these statements are true and repeating them always will impose a more positive opinion about your life. This method used by psychotherapists helps you control your thoughts when you start to feel negative emotions like depression or anxiety. When you feel such emotion taking hold on you, start generating a happy mind, a positive thinking, something that makes you feel better to keep your negative feelings under control. Nothing compares with self confidence that creates a successful reality. Put your doubts aside and believe that you will succeed in meeting the objectives. Positive thinking is not about denying that nothing can go wrong. Instead take the time to see what went wrong and what led to the current situation in order to avoid future mistakes. Don’t always argue for things that will not change anything. Sometimes the most negative things in our lives give us opportunities that we wouldn’t have seen. For example losing your job can be a good opportunity to open your own business or go back to school. Visualizing what you want to achieve, or the kind of person you want to become, can also be a great motivation, to take you there and make you think more positively about the distance that you have until the destination. By focusing on being consistent with my morning ritual I have built up momentum and trained myself to have a positive mindset. I have kept a positive journal since April 2013 but a few things have compounded my positive outlook on life and I know these things to be true. After attending a Tony Robbins seminar in January he gave me the gift of 3 techniques that take no longer than 15 minutes to complete. I like them so much that I usually spend about 30 minutes completing the techniques. I believe the term Tony uses is called Priming (below are the techniques). I have done them without fail consistently since January the 8th and they took me to the next level of having a positive mindset. I then added one more to the list and my mood went from feeling good to feeling incredible, feeling so good some days I wanted to cry with sheer joy. Shake everyone’s hand in the office. We all have bad days when we feel down and out. We get discouraged and frustrated and start to focus on problems and what’s going wrong. That is why having ways to elevate our state of mind is so valuable. When we notice ourselves getting negative, we can have a plan to shift our state of mind. The strategies for elevating your positive state is by making time for emotional, physical, mental, and spiritual needs each day. Then realize how important small daily actions are to your overall health, happiness, and productivity. It helps you get a more stable rhythm in life and understand nourishing yourself is these different areas, which will allow you to approach life from a more whole and powerful state of mind. Ultimately if you are willing to nourish each of these life domains you can live with greater purpose and passion, and will always be a better person all the way around. These are things to merge into your life to help you elevate your positive state. What do you do to nourish your soul each day? I believe that we all need some form of spirituality to stay inspired and resilient, on a daily basis take some time to feed your spirit. This may be through meditation, yoga, prayer, or some other form of spiritual practice. Do whatever fits your system. Take just 10-15 minutes to nourish your spirituality. Cultivating positive emotions is the best way to build immunity to a bad mood. Gratitude is one just emotion to start cultivating but it’s a powerful one. A gratitude practice such as writing a gratitude list each day or writing a gratitude letter can help keep you in a positive state of mind. It makes you give thanks for the day ahead of you. From the moment you wake up in the morning, think about what ideas your filling your mind with. Many people wake up watching the news and filling their head with stories or tragedy and fear, how would your life change if you started reading a daily devotional or inspiring article, another thing I do when I’m driving in my car is listen to uplifting audio books. We don’t always notice how contagious other peoples’ emotions are. If we are around negative, discouraging people it will eventually rub off on us. Find supportive and encouraging people that you can interact with as often as possible. It may not be every day that you interact or talk with these people, though hopefully it is, but if you have someone that can offer you support when things aren’t going well, you will have a greater chance of staying positive. Take care of your physical health has more influence on your mental health. If there is one habit that improves your mood and enhances your overall health and wellness it’s exercise. It enhances our cognition, slows cellular aging, and serves as a natural antidepressant. So, if you want to be at your best, exercise is a must. Think about a sliding doors moment where something really positive happened to you purely by chance and the positive consequences that occurred because of it. Follow these steps and have a good mood. The number one tip experts give for changing your mood is to exercise. Choose something you enjoy doing, yoga, walking, rollerblading, or a dance video workout, a short and fast workout can relieve stress and release feel-good endorphins. Think of your athletic shoes as happy shoes. Small healthy snacks throughout the day keep your body satisfied. Eat less white rice, pasta, bread, sugar and potatoes. Incorporate grains, vegetables, nuts and seeds in your diet. You’ll feel authentic, heard, and confident. Withholding what you think can cause feelings of helplessness and hopelessness. Spend your money on experiences. Sign up for a painting class; go to the museum, or a concert. Experiences create wonderful memories. Go to the big room with the blue ceiling and green floor. Take a walk in the woods or watch a sunrise. Sitting outside for five minutes a day is enough to feel good and change your mood. Physical affection is powerful. Give and receive a kiss, a hug, a pat on the back, a touch on an arm or go for a massage. Touch is transformational. Warm fuzziest can feel good. The anxiety you feel about a chore is worse than the actual chore itself. Get rid of dread and do what’s on your list: wash your car, make a phone call, and cancel a date. Look for a way to compliment someone. Anticipate and meet the needs of the people around you. When you bring happiness to others you also bring it to yourself. The smallest act of caring can cause a mini-bliss explosion. Look for what’s good in your life. Look for reasons to be thankful. Focus on the positive. You can’t be unhappy and be positive at the same time, go to bed and get up at the same time every day. Creating a routine and getting seven hours of sleep will allow you to wake up on the bright side. Smiling makes you happy even when you’re feeling sad. Smile at yourself in the mirror. Smile at the people you love and even the ones you don’t. We underestimate the transforming power of a smile. There’s not much a great song won’t cure. Runners listen to their iPods while running marathons because it’s less painful. Shoes and clothes that are too tight create pain. Don’t sacrifice your health to look hip. Dwell on love. Feel love. Send love to people in trouble or in pain. Send loving thoughts to your family and friends. Speak lovingly and take loving action. If I want to supercharge the morning then think about a time when you were in a great mood and reenact how you felt at the time, for example when Robbie Brady scored a goal at the Euros. I jumped up and down the house and screamed with joy, (what made this even better was my two infant sons copied my behavior), when I want to get back into that state I do the same actions. We often hear people being described as positive or negative. However, the truth is that a positive attitude is a choice, not an innate trait. You have the power to change your mindset, and committing to this change can lead you to a happier, more successful life. Simply behaving like a positive person can shape your attitude and slowly change the way you see the world. For example, studies repeatedly show that forcing a smile can actually lift your mood and that acting like a confident person. Also start to transform your self-esteem. Smile at strangers as you pass them on the street, try to eliminate negative adjectives from your vocabulary, carry yourself like you are having a wonderful day, and invite friendliness by engaging in conversation with others. At home, try to surround yourself with positive images and motivational objects that make you feel content or inspired. Listening is the key to all effective communication, without the ability to listen effectively, messages are easily misunderstood, communication will breaks down and the sender of the message can easily become frustrated or irritated. Communication is so important that many top employers provide listening skills training for their employees. This is not surprising when you consider that good listening skills can lead to: better customer satisfaction, greater productivity with fewer mistakes, increased sharing of information that in turn can lead to more creative and innovative work. Many successful leaders and entrepreneurs credit their success to effective listening skills. Richard Branson frequently quotes listening as one of the main factors behind the success of Virgin. Effective listening is a skill that underpins all positive human relationships, spend some time thinking about and developing your listening skills – they are the building blocks of success. Hearing refers to the sounds that you hear, whereas listening requires more than that: it requires focus. Listening means paying attention not only to the story, but how it is told, the use of language and voice, and how the other person uses his or her body. In other words, it means being aware of both verbal and non-verbal messages. Your ability to listen effectively depends on the degree to which you perceive and understand these messages. The most basic and powerful way to connect to another person is to communicate. Perhaps the most important thing we ever give each other is our attention. Practice overcoming negative self-talk with examples provided. It’s unclear why people who engage in positive thinking experience these health benefits. One theory is that having a positive outlook enables you to cope better with stressful situations, which reduces the harmful health effects of stress on your body. It’s also thought that positive and optimistic people tend to live healthier lifestyles they get more physical activity, follow a healthier diet, and don’t smoke or drink alcohol in excess. Think on happy things even in negative circumstances.